The versatility and beneficial properties of poly(2-oxazoline)s has fostered a great deal of research resulting in a wide variety of applications. PAOx/POZ enable the development of innovative products: at ULTROXA®, we are committed to support you all the way, from product development to market. We have adapted production methods to meet both the medical and the larger-scale non-medical industries, always providing the highest quality product for your application. The combination of polymers and pharmaceuticals is enabling the development of advanced drug delivery systems providing high efficacy while minimizing side-effects. Polymers enhance drug solubilization, stability, bioavailability and pharmacokinetics, while also allowing the introduction of targeting units, thereby dramatically improving the pharmaceutical value of the API. Polymer conjugation is applicable to either low molecular weight drugs, peptides or proteins. A water soluble polymer can confer several properties to the linked molecules: i) increased half-life due to reduced kidney clearance, ii) protection against degrading enzymes or reduced uptake by reticulo-endothelial system (RES), thanks to steric hindrance imposed by the polymer iii) increase in water solubility, particularly relevant for anticancer drugs and novel highly hydrophobic drugs, iv) prevention of immunogenicity of proteins and v) selective tumor accumulation (read more). Polyethylene glycol (PEG, or PEO) is the most widespread used polymer in biomedicine, with over 10 PEG-based products approved, for the purposes of increasing half-life and preventing immunogenicity of proteins. 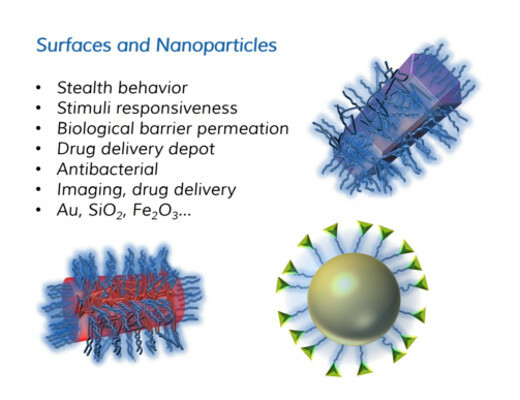 Although PEG remains the gold-standard in polymer based biomedical applications, based on its low dispersity (Ð), biocompatibility and stealth behavior, it has important drawbacks and limitations. The development of anti-PEG antibodies has repeatedly been observed in some patients, including 25% of patients never treated with PEGylated drugs (due to its ubiquity in cosmetics, and food additives), and is suggested to be responsible for the accelerated blood clearance of PEGylated conjugates after multiple injections. In addition, the polyether backbone of PEG is prone to oxidative degradation limiting its use for long term applications such as in implants. Finally, the profuse number of patents protecting a variety of compositions and applications of PEG-based formulations hinders further research and development on novel therapies. PAOxylation (or POZylation) constitutes a promising alternative to overcome the pitfalls of PEG while retaining the required features, such as biocompatibility, stealth behavior and low dispersity. 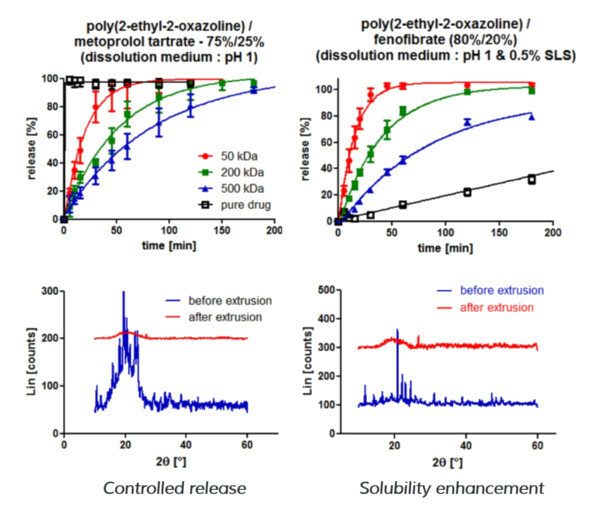 In addition, poly(2-oxazoline)s also offer responsiveness, high functionalization possibilities, and high versatility attainable by copolymerization, features that make PAOx/POZ an ideal polymeric platform for novel biomedical applications. Poly(2-oxazoline)s set themselves ahead as they display all the required features for the ideal polymer platform for novel biomedical applications. We have developed a versatile linking technology to connect multiple APIs to the polymer chain with the ability to provide sustained or controlled release. Polymer hydrophilicity, chain length, and the number and nature of the functional groups incorporated can be precisely tuned to obtain the optimal drug carrier. As such, our ULTROXA® technology constitutes an ideal platform to be broadly applied for the development of highly effective treatments. In the field of cancer treatment, antibody-drug conjugates (ADCs) hold a great promise as they have the ability to recognize low density receptor targets on the cancer cell. This extremely efficacious class of cancer therapy has bloomed in the recent years with dozens of new ADCs entering the clinical pipeline. Conjugation of the antibody as a targeting unit to one or several poly(2-oxazoline) chains enables the preparation of high capacity ADCs that can not only improve current treatments but also enable successful targeting of more specific antigens with lower expression in the cancer cell. 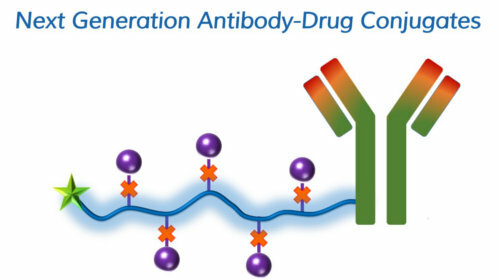 Targeted delivery including antibody-drug conjugates with high DAR. Cleavable linkers for controlled delivery of the prodrug (pH-, enzymatically cleavable…). Subcutaneous application for long-term sustained drug delivery. ULTROXA® highly defined and pure polymers amenable for biomedical research. We design the optimal polymer for your application, contact us. Functionalizing your surface or nanoparticle with poly(2-oxazoline)s provides a number of advantages. You might want to confer your substrate with the polymer properties (antifouling, controlled hydrophilicity…), especially as PAOx/POZ exhibit a very high stability towards degradation (long-term implants). Recent pharmaceutical advances (high-throughput screening and combinatorial chemistry) have led to the development of an increasing number of new active pharmaceutical ingredients (APIs) that offer great medicinal potential. However, ca. 70% of these novel API molecules do not reach the market because of low water solubility and low bioavailability. In this respect solid solutions and solid dispersions, in which the API is dissolved or dispersed in a poly(2-oxazoline) matrix, has been proven to greatly enhance the dissolution properties of highly hydrophobic APIs. In addition, poly(2-oxazoline)s have demonstrated an extraordinary ability to protect unstable APIs against degradation. As an example, formulations with PAOx/POZ protect the unstable API tetrahydrocannabinol (THC, Dronabiol) 350 to 800% better than the state-of-the-art excipients (Eudragit®, Soluplus® or Plasdone™). Our ULTROXA® polymers bring many benefits to your formulation, contact us to know more. Significantly increase hydrophobic drug solubilization rate. Ideal Tg range for Hot-Melt-Extrusion/injection molding processing. We have the right polymer for your application, Contact us. 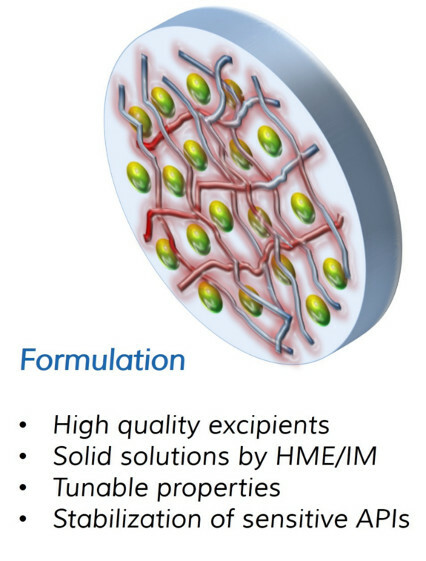 Hydrogels are typically cross-linked polymeric materials capable of entrapping large amounts of water and harbor characteristics that resemble those of biological soft tissues finding applications in controlled drug delivery or 3D tissue culture, tissue engineering and medical devices. 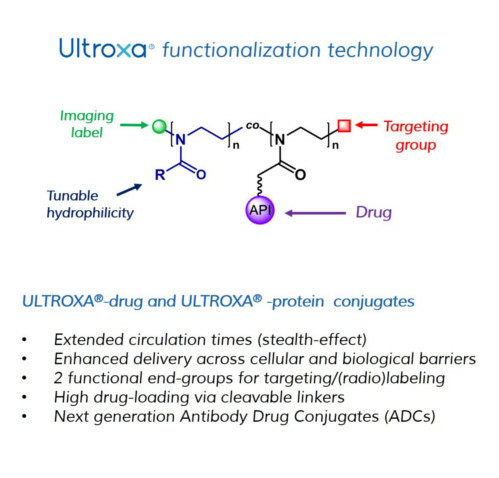 ULTROXA® allows total control over the polymer composition and functional groups can be located throughout the polymer chain affording, after cross-linking, the materialization of a pre-designed structure and architecture. 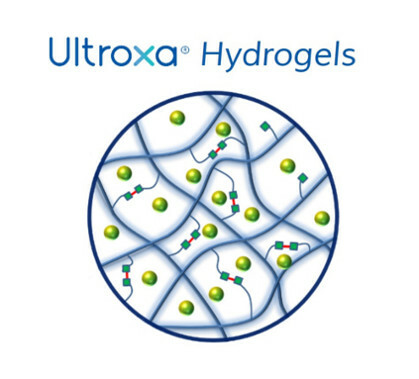 This feature, together with the biocompatibility, stealth behavior, and stability properties already discussed, make ULTROXA® and ideal platform to build hydrogels. Example of light crosslinkable hydrogel. Hydrolytically cleavable crosslinkers can be incorporated in the structure, obtaining degradable hydrogels of interest in sustained drug delivery or tissue engineering. The video shows the rapid gelation of a solution containing one of our functional poly(2-oxazoline)s, together with a cross-linker and a photoinitiator. The obtained hydrogels were cell-repulsive, due to the antifouling properties of PAOx/POZ. However, when the adhesion peptide sequence (RGD) was also incorporated in the polymer, fibroblasts attached to the hydrogel through exclusive recognition of the peptide. The whole mixture of hydrogel precursor and cells could even be irradiated under UV light for hydrogel formation, thanks to the protective environment supplied by the polymer (read more). Recently, our partner GATT Technologies B.V., developed a tissue adhesive medical device based on our ULTROXA® side-chain functional polymers. The ULTROXA®-based surgical tissue tape benefits from the polymer structural versatility to tailor the strength, flexibility and degradability properties of the final product. The surgical tape does not require preparation, is easy to position, and provides adhesion after just 20-30 seconds in contact with moist tissue. The tape provides enough time for the tissue to heal while biodegrades in under 6 weeks. Controlled cell adhesion: Antifouling or cell-adhesive. Low viscosity, injectable: Drug-depots for sustained release. Branched polyethyleneimine (PEI) has been regarded as the gold standard in gene transfection; however, high cytotoxicity has been found in vivo, hindering its broad application as a non-viral gene carrier. 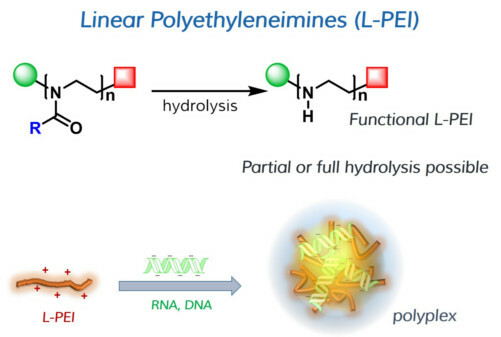 Linear PEI (L-PEI) has been demonstrated to partially overcome the cytotoxicity issues of its branched counterpart and it can be obtained from the hydrolysis of poly(2-oxazoline)s.
We have strong expertise in producing high-quality linear PEI and also partially hydrolized derivatives for applications in gene delivery. The ULTROXA® portfolio has a range of different functional L-PEI polymers with the optimal molar mass for the highest transfection efficiency. Introduction of functionality (azide, alkyne, allyl, primary amine…) at the polymer chain ends. Optimized polymer chain length for transfection. Absolute control over the degree of hydrolysis for PAOx-PEI/POZ-PEI copolymers. Ultra-defined polymers (Đ < 1.1). Here a selection of scientific publications and references related to applications of our technology. G. Pasut and F. M. Veronese. Adv. Drug Deliv. Rev. 2009. K. Knop, U.S. Schubert, et al. Angew. Chem. Int. Ed. 2011. J. J. F. Verhoef and T. J. Anchordoquy. Drug Deliv. Transl. Res. 2014. A. Mero, R. Hoogenboom, F. M. Veronese, et al. J. Control. Release. 2007. M. Bauer, D. Fischer, et al. Macromol. Biosci. 2012. T. X. Viegas, M. D. Bentley, et al. Bioconjugate Chem. 2011. A. Mero, F. M. Veronese, T. X. Viegas, et al. J. Control. Release. 2012. J. Tong, A. V. Kabanov et al. Mol. Pharmaceutics. 2010. R. Luxenhofer, R. Jordan, et al. Macromol. Rapid Commun. 2012. V. R. de la Rosa, J. Mater. Sci. Mater. Med. 2013. R. W. Moreadith, T. X. Viegas, et al. Eur. Polym. J. 2016. O. Sedlacek, R. Hoogenboom, M. Hruby, et al. Biomaterials. 2017. V. R. de la Rosa, R. Hoogenboom, et al. Adv. Funct. Mater. 2015. E. D. H. Mansfield, V. V. Khutoryanskiy et al. Biomater. Sci. 2016. P. Wilson, K. Kempe, et al. Eur. Polym. J. 2017. G. Morgese and E. M. Benetti. Eur. Polym. J. 2017. H. Bludau, R. Jordan, N. F. Steinmetz, et al. Eur. Polym. J. 2017. G. Morgese, M. Zenobi-Wong, E. M. Benetti, et al. ACS Nano. 2017. L. Tauhardt, K. Kempe, M. Gottschaldt and U. S. Schubert. Chem. Soc. Rev. 2013. B. Claeys, R. Hoogenboom, B. G. De Geest, et al. Macromol. Rapid Commun. 2012. H. P. C. Van Kuringen, B. G. De Geest, R. Hoogenboom, et al. Macromol. Biosci. 2012. J. C. M. E. Bender, R. Hoogenboom, P. A. A. van Vliet. WO2011002285 A1. 2011. A. M. Kelly and F. Wiesbrock. Macromol. Rapid Commun. 2012. C-H. Wang, Y-S. Hwang, G-H. Hsiue, et al. Biomacromolecules. 2012. T. R. Dargaville, R. Hoogenboom, et al. Cell Adh. Migr. 2014. B. L. Farrugia, T. R. Dargaville, R. Hoogenboom, et al. Biomacromolecules. 2013. C. Legros, D. Taton et al. Polym. Chem. 2013. S. Lück, S. Pautot, R. Jordan, et al. Biomaterials. 2015. T. R. Dargaville, R. Hoogenboom, et al. Biomacromolecules. 2016. K. P. Luef, S. Reynaud, F. Wiesbrock, et al. Eur. Polym. J. 2016. D. J. van der Heide, T. R. Dargaville, D. K. Hickey, et al. Biomater. Tissue Technol. 2017. S. Y. Wong, D. Putnam, et al. Prog. Polym. Sci. 2007. S. O’Rorke, M. Keeney and A. Pandit. Prog. Polym. Sci. 2010. M. Breunig, A. Goepferich, et al. J. Gene Med. 2005. M. Thomas, A. M. Klibanov, et al. Proc. Natl. Acad. Sci. U.S.A. 2005. J. H. Jeong, T. G. Park et al. J. Control. Release. 2001. B. D. Monnery, J. H.G. Steinke, et al. Macromolecules. 2015. Interested? Explore our product range!